Finding the right foundation can be such a massive confidence booster, but often it’s like seeking a needle in a haystack. Over the next month, I’ll be putting a LOT to the test to get to the bottom of which ones are best for different skin types, tones and budgets. Today I’m taking a look at three new high end launches – each is very different but equally fabulous for different people. Make Up For Ever Ultra HD* – if you’ve previously tried MUFE’s HD foundation, then you’ll know it gives a flawless finish to the skin, without looking like you’ve got a layer of makeup on. Ultra HD is an enhanced version of this and I am fully in love with the formula. Ultra HD has been designed to look completely natural both in real-life and on screen and was created to deal with the amazing detail the new 4K TV technology can go into. This gives a nice medium coverage, comes in 18 shades and honestly looks almost invisible once applied. Oilier skins will benefit from a little setting powder over the top, but in general, this should work with pretty much every skin type. It doesn’t add a ‘glow’ to your skin as this can look unnatural on camera, but instead will give an even, flawless complexion that will make you want to stock up on multiple bottles. Buy it from Debenhams, priced £29. Bare Minerals Blemish Remedy* – Blemish Remedy is the latest launch from Bare Minerals and has been targeted for those with oily or spot prone skin. It’s been formulated to minimise the appearance of blemishes, redness and pore size and contains Aspen bark and tea tree oil to help promote clearer skin. It gives a light-medium coverage that’s easily built up in areas that need it. The loose mineral powder formula can take a little getting used to if you’ve not used one before; grab a buffing brush and apply a little at a time, buffing in using a circular motion. I think this definitely benefits from a primer to help in terms of longevity as it doesn’t tend to last as long as some liquid formulas, but you should get a very natural, non-cakey finish. There are 10 shades to choose from, priced £26. 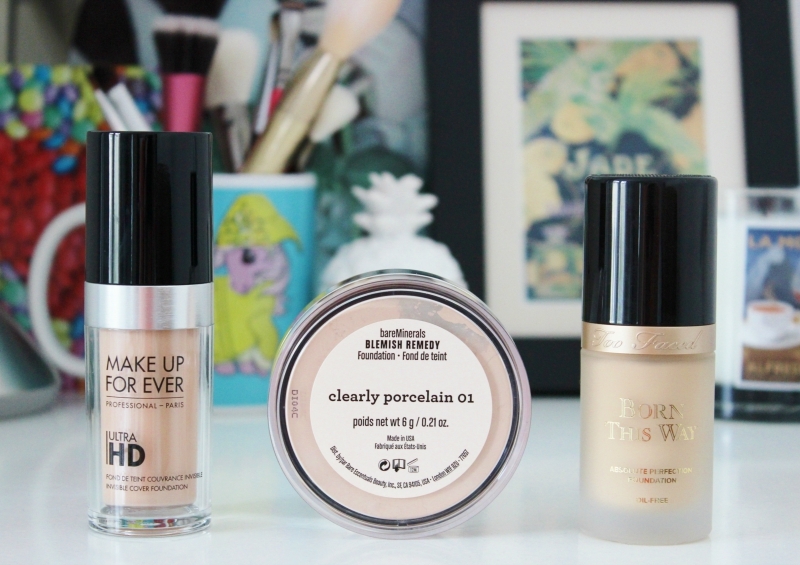 Have you tried any of these new foundations? Which ones will be going on your wishlist?